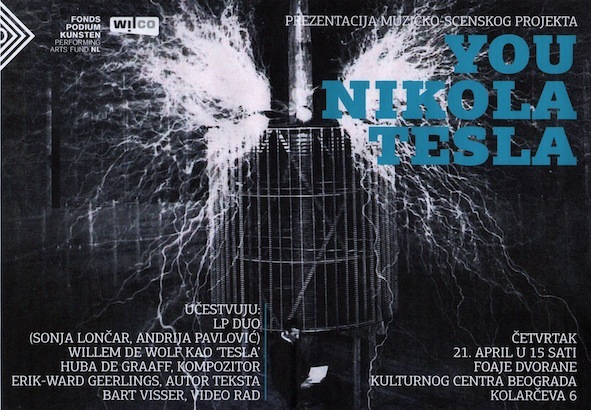 A multidisciplinair musictheatre-project about Nikola Tesla, one of the greatest scientist of mankind. On stage the audience will be witness of the physical struggle of the actor and musicians in creating a world of imagination in sound (music and spoken text). The poetic text will be a monologue interior, recorded and reproduced. The scenery shows two electronically prepared piano’s: a kind of 19th century experiment with lots of wires. ‘TESLA’ is about the impotence of really controlling the material world. Even now, when lots of Tesla’s dreams have come true, it is about the friction of material vs the utopian wireless access of free information for everyone. About dreams vs reality.